This article by Rachael Barrett appeared in the Jamaica Observer. Our thanks to Peter Jordens for bringing this item to our attention. 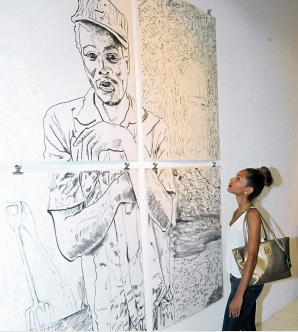 See our earlier post, Jamaican Biennial goes international (November 30, 2014). Critiquing this biennial is an especially difficult challenge as the 2014 newly christened Jamaica Biennial represents a significant turning point in Jamaica’s fine art history. For the first time the Jamaica Biennial has been juried by a committee including leading curatorial figures from institutions within the region. This is particularly significant as it broadens the curatorial scope from the National Gallery’s team to include fresh “eyes” to survey and assess the work submitted for exhibition. This is the last incarnation of the invited artist section, through which particular artists from within the local artistic community who had previously attained “invitee” status can submit works to the biennial without critical right of refusal. 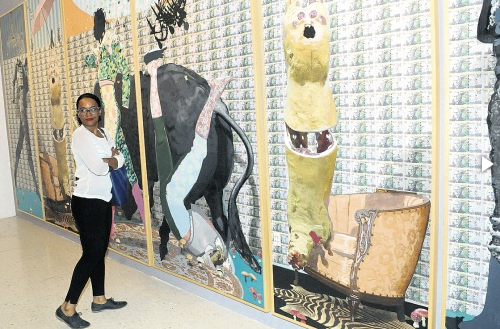 The biennial this year also spreads beyond the concrete walls of the National Gallery throughout the streets of Kingston and inside national landmark Devon House with projects from invited international artists, significantly all from the Caribbean, and also features an exhibition in the newly minted National Gallery West in Montego Bay. For the first time I can say unequivocally that I am proud of our local biennial. As an art professional I travel regularly to see art fairs, exhibitions, museums and biennials across the globe and this is the first time that the biennial in Jamaica has finally adopted, in a much more comprehensive way than before, the visual language and curatorial rhetoric of global contemporary art. The addition of international jurors allows an alternative perspective of our nation and diaspora’s artists to emerge. Allowing the biennial to function as a vehicle for international curatorial engagement for our artists is also an invaluable elevation of its purpose. This 2014 exhibition tackles in a way that has not been previously attempted the question of what makes a great biennial. Our previous biennials were misnamed. They really functioned more as national exhibitions. We love our people and I appreciate the pride in having an exhibition that showcases the best of our national talent. However, the hallmark of a great biennial is the creative discourse – the themes explored, concepts challenged and evolution of the work on display. The Venice Biennale is the world’s oldest biennial exhibition of contemporary art and regarded as the most significant in terms of the size, quality of work and range of nations exhibiting under a single curatorial. Closer to us, the Sao Paolo Biennial is the second oldest and was established to function as an important dialogue between the global contemporary art world and Latin America. Dr Veerle Poupeye, the executive director of the National Gallery, notes that the “…future vision is for the Jamaica Biennial to become an international exhibition with a strong Caribbean focus”. In art circles the word important is often tossed around, but this statement is particularly so as it demonstrates the vision behind this moment of change. Change is a tricky thing, and while this biennial has improved, this is not to say that there are no teething pains to contend with. As this biennial marks a transitional phase in the process of change, the discrete collection of artwork on display makes a clear case for the future biennials to be curated under a single theme to add a more cohesive rhetoric. Jamaicanness alone is not enough of a curatorial thread as our artists address a wide variety of issues and concerns, through a broad spectrum of media. As Jean-Michel Basquiat once said, “I am not a black artist; I am an artist.” Great art always transcends boundaries marked by geography or government. Jamaicans can proudly note that our 2014 biennial features work that addresses themes as diverse as the holocaust, ecological concerns, blackness, whiteness, mixed-identity, spirituality, sexuality and social justice. Great art also transcends physical abilities and educational pedigree. It is important to note that the biennial features artists, with physical restraints and limited education, alongside each other as equals. Outside institutions could learn from this. There were many local grumblings at the announcement of thye phasing out the invitee policy, and I applaud the efforts of the local boards and advisors for the battle they have won in getting this ridiculous policy removed. As evidenced in the post- modern “ghetto” left in an upstairs nook of the gallery, as well as most of the juried artists selected being 40 and under, clearly there is a disparate connection between how to satisfy the different tastes and forms of art represented in the island. Grouping work according to style alone is a disservice to the artist. That said, it is fairly impossible to assemble a cohesive exhibition when there is not much say in what the artist can submit. Curating under a single theme would assist with ensuring there is more of a clear relationship between the diverse media of work on display, and removing the antiquated invitee system will perhaps force some of those artists to step their “game” up to fight for a place within the exhibition with new challenging work like everyone else. Timing and resources, as in years before, are a challenge. Spreading the biennial to different sites is clearly a positive step towards allowing for greater engagement with the arts across the island, far from the traditional Kingston-centric mentality. However, this meant thinning out the resources of an already thin team, within what also seemed an unfeasible period of time between the tender process and exhibition release. Too many of this biennial’s great “moments” can be overlooked because of inconsistencies with presentation or too thin a connective tie between the works. The works were also all created and, with the exception of Matthew McCarthy’s performance on opening day and his online magazine Regal Zeen designed to continually update over the course of the exhibition, one wishes there were more artworks, performances and symposia designed to unfold over time to keep the biennial an active engagement of contemporary art over the full exhibition period. The Devon House-based exhibit is of exceptional quality, and I am aware an immersive installation of this type is rare on the island. Compared to what is produced elsewhere, one cannot help but wonder how much further the immersion could have been pushed with more time to consider how best to work with the space itself as raw material. Installing in found spaces with conservation restrictions is not easy, and the works look beautiful but are a very simple “putting of things on things” means of engagement with the rich history of this Kingston landmark. Laura Facey’s rubbings and sculpture, while evocative of a rich natural historical significance, could have done a more provocative commentary on the historical past of the space or even referenced the contemporary musings on the significance of that history as she does with ‘Redemption Song Monument’ at Emancipation Park. Performance, audio, film, streamed engagement, onsite comparisons with works removed and works brought in, or even alterations to the existing space itself as a medium, are all means of engagement that are not fully explored. The closest one gets to that comes from international rising star Ebony G Patterson, whose installation intelligently interacts with the entire space allocated, transforming her space with colour and texture in addition to laying out work “in situ”. The “special projects” moniker was chosen to introduce artists from within the Caribbean region to the biennial. However, in practice these projects are part-project, part-artwork, and, in the case of some sites, are intermingled into the broader exhibition. It would be interesting to see true projects emerge in the future with invited artists creating true projects that incorporate artwork as well as some other means of activation. People often ask me what is used to determine the demarcation between “good” and “not so good”, when it comes to contemporary art. Truthfully, art remains a subjective thing. However, in the case of determining an improvement in this exhibition, one can use aesthetic markers to ascertain how this biennial compares to its foreign counterparts in terms of the aesthetic qualities of the work on view. The vast range of media of work on display echoes a more contemporary view of what it means to be an artist in 2014, and the range of artists making this type of work demonstrates that both educated and intuitive artists continue to evolve using the diverse tools in their environments. I was amazed to learn that Di- Andre Caprice Davis is a self-taught artist, as her incorporation of performance, digital media, colour and concept are on point with work on view at the Hammer, MoMA, and Tate and reflect the current post-Internet movement at the forefront of international contemporary art and explored by many other artists far senior in age and with years of education under her belt. On the other side of the spectrum, ceramic sculpture, often regarded as a craft, has lately been the subject of many exhibitions that explore how significant Western contemporary artists such as Cameron Jamie and Sterling Ruby use this simple material in making evocative contemporary work regarded as fine art and not craft. Basel Watson’s Broken Wing, Norma Rodney Harrack’s Fragment, Michael Layne’s Human Habitat series and Toorel Asher’s Tower of Tenderloin illustrate our own artists who use the medium in interesting ways. The more traditional mediums of painting and sculpture show work that ranges from the classically styled, such as Philip Thomas’ IMF. …(u***d) and Rex Dixon’s Tropical Highrise and Between the Lines. Thomas sticks with his usual grandiose style repeating his traditional palette and five years and counting featured subject images, adding banknotes with Michael Manley’s image to add social comment. Dixon’s abstraction features a mature pairing of colour and pattern, but in such a fresh juxtaposition that I admit I was surprised to discover his age! Sculpture in carved, tooled, and shaped forms of all sizes and material demonstrates that this media continues to be popular locally. Deborah Anzinger’s Watershed most interestingly pushes into contemporary uses of the form beyond making static objects – the living plants are part of her work of an upturned figure’s legs, meant as an examination of how people navigate their environment. Most people assume this is a female figure, the artist has left this deliberately unclear. Film and photography make up a large part of the exhibition this year, and the photography alone could really be split into its own survey as the quality of work on view is impressive. Again, this measure is drawn from the range of archival photography, collage, portraiture, still life, abstraction and processes in the photographs on view. Olivia McGhilcrist uses film as a means of asking questions through repeated performance and Storm Saulter and Renee Cox explore the interjection of film and photography in their layered images, although I must say Saulter’s film, a collaboration with Trinidad-based multimedia artist Rodell Warner, appears much stronger despite Warner and Saulter being much younger artists in that field. The use of found graphics, film, and digital manipulation of found patterns to create a new visual is mesmerising but, most importantly, a uniquely powerful visual. Another marker in assessing work within the global contemporary landscape is determining how much work looks like other work…is this repetitive?… is this derivative? Cox’s work appears too much a victim of her New York roots, a less technically impressive Marco Brambilla-esque digital manipulation, and a less impactful Rashaad Newsome-esque exploration of blackness. The increase of multi-media installations is also a hallmark of the “new” face of the biennial, and it is telling as both the winner of the Dawn Scott Memorial Award, Camille Chedda, and the Aaron Matalon Award, Ebony G Patterson, technically are artists who mostly work within the most traditional of artistic forms, portraiture, but do so using exceptionally interesting media. The 2014 Jamaica Biennial represents a significant moment of change in our artistic and cultural history and I express sincere congratulations to those who have fought to ensure this change became a reality. I hope most Jamaicans make an effort to go and view the changing future of our art and culture – the attendance figures during opening week were higher than ever in the history of the exhibition, and interestingly, the most varied in terms of socio- economic background, especially in Montego Bay where I observed onlookers from Sam Sharpe square wandering in to take a peek. Fittingly, it has been announced that “culture” is the word of the year for 2014. Culture in all its incarnations in this contemporary age is global, and our biennial reflects this global sensibility elevating our art and culture to compete and excel on a global level as our athletics and music already do.